Have you ever had Ethiopian food? Yeah, I hadn’t either. Until Tuesday. My car-less roommate had to visit an Ethiopian restaurant for her Soils and Civilizations class, so, being the good friend that I am, I acted as chauffeur. Truth be told I was intrigued having never tried Ethiopian cuisine. I’m always up for trying new foods and she offered to pay so really how could I say no? We pulled up to a small little restaurant entitled Gosh (pronounced like gauche.) The inside was very neat and clean. Having just eaten lunch, we ordered an appetizer and a dessert. 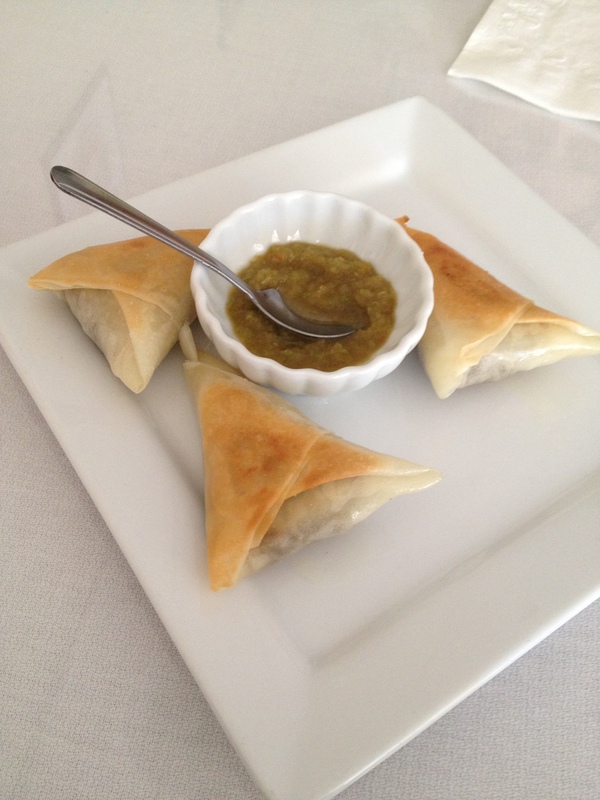 The appetizer was a Meat Sambbussa – an Ethiopian style pastry shell stuffed with beef, fresh garlic, jalapeno and onions – served with a sort of pickled, jalapeno sauce that looked like salsa verde. 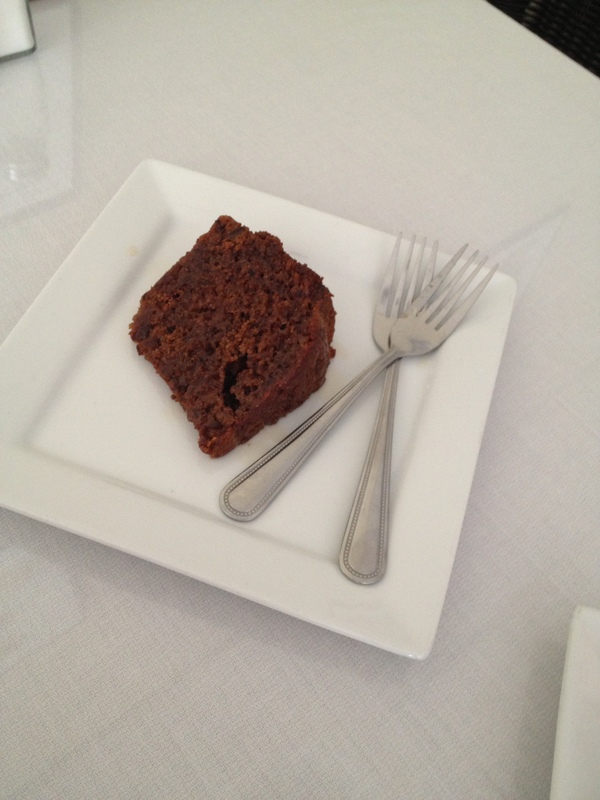 And for dessert, Date Cake – simply dates, butter, baking soda, sugar, egg, flour, pecans, and baking powder topped with a rather strong Brandy sauce. They were both delicious leaving us pleasantly surprised and curious for more. Conveniently located next door was an International market in which my roommate bought Baklava – an Ottoman Turkish pastry made with layers of filo dough and filled with copped nuts and honey or syrup. I actually despise honey, but the Baklava was pretty tasty. Very rich though, just fair warning. Would I go back to Gosh? I’d say so. The atmosphere was really peaceful, and the two dishes I ate were so unique that I’d like to try more. Especially one of the entreés which were served on what looked like huge tortillas on round baking sheets. I’m sure those are not the technical names, but I guess I’ll just have to go back to find out. Very elegantly presented. My partner prepared lentil soup and Bruschetta this evening. We are foodies; appreciate your post!